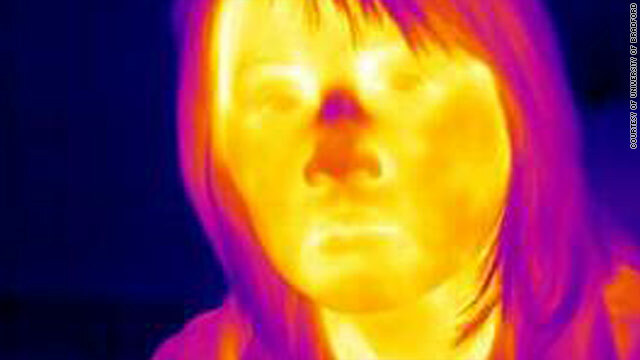 Researchers in the UK are using thermal imaging as part of a new lie detector system which could be used at airports. (CNN) -- Anyone with a burning conscience might want to look away now. Researchers in the UK are turning to thermal imaging technology in a bid to spot liars. Experiments on the new lie detector being developed by the University of Bradford in the north of England are still at an early stage but have, so far, yielded some promising results. "We have developed a system by which we can analyze people's faces for detecting lies in an interview scenario," said professor Hassan Ugail, director of the Center for Visual Computing at the university. The thermal imaging camera, Ugail explains, captures variations in facial temperature in response to questioning. "When someone is making something up on the spot, brain activity usually changes and you can detect this through the thermal camera," Ugail said. The areas around the eye -- the periorbital -- and the cheeks are highly sensitive to temperature rise, Ugail says, and in some cases it's possible for individual blood vessels to be tracked. Working in tandem with the thermal imaging is a standard camera which tracks facial gestures frame-by-frame which are analyzed using Facial Action Units -- a system for categorizing facial expression devised by American psychologists Paul Ekman and Walter V. Friesen. The information is collated and fed into a computer where a specially created mathematical algorithm assesses how truthful a respondent has been. Around 30-40 subjects having been tested so far with a two in three success rate. It's still very much work in progress, Ugail says, and refinements are ongoing, but he and the system's co-developers at the University of Aberystwyth in Wales are hopeful that the device can find real world applications. The technology is due to be trialed at a UK airport later this year in the hope it can assist current profiling techniques used by the UK's Border Control Agency. But Aldert Vrij, professor of applied social psychology at the UK's University of Portsmouth, isn't convinced that thermal imaging on its own is a useful addition to a lie detector's armory. Writing in the journal Law and Human Behavior in November 2010 Vrij and colleagues concluded that thermal imaging is unlikely to be effective at improving airport security. Their study of 51 passengers at an undisclosed international airport found that thermal imaging "will classify too many non-deceptive passengers as liars because they may be anxious for non-deceptive reasons. "The assumption that liars are more nervous than truth-tellers is incorrect," Vrij said. "A machine may be accurate in measuring nervousness but that doesn't mean someone is lying." Ugail concedes Vrij has a point, but using two modes of detection, as the technology he's developing does, makes the system more robust and could provide interrogators with a new tool which could run alongside existing verbal strategies. Lie detection is a difficult task, Vrij says, as there are no nonverbal or verbal cues that can be completely relied upon. Most research indicates that detecting truths and lies becomes more successful when you take speech content into account. But if the new device can prove its worth, so to speak, then Ugail is confident it can find a place not just at airports, but in police stations and, perhaps, in job interviews.